Here we go AGAIN, guys! Insane Charity Bike Ride 2018 is two months away. I need to get training! Also: I need your help! The Bike the Barns ride (what normal people call “Insane Charity Bike Ride”) helps Madison’s FairShare CSA Coalition bring fresh food from local farms to low-income families in the Madison area. It’s an amazing local charity, helping farmers as well as families in need. 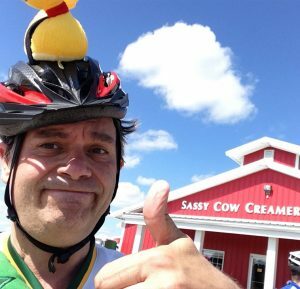 I’m trying to raise $10,000 this year – fingers crossed – at which point, I wear a duck on my head again, as I cycle this year’s insanely long, hilly ride! YOU KNOW THE DRILL BY NOW! BUT YOU ALSO KNOW THAT THERE’S SWAG! Lookie! ANY and EVERY pledge will get a pdf of the limerick Neil Gaiman created for the ride in 2014, illustrated by me. PLUS, a pdf copy of both charity coloring books I drew. Any pledge $25 or more gets a brand-new, signed MUNCHKIN CHARITY POSTCARD! Created exclusively for donors of this ride, this will let you start one game of Munchkin at Level 3! Did you get a good look at it? Let’s call it Hammunchkin, shall we? 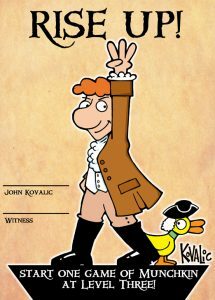 Or Hamilduck. Look at it! LOOK AT IT! Do not throw away your shot! Any pledge $50 or more will get all of the above, plus a unique-to-this-ride new Hamilduck ARMY OF DORKNESS Sergeant button and enlistment card! Any pledge of $155 or more will get all of the above, plus all five previous Charity postcards! I came across a stash of a few, from years past. (19 of 20 left). Any pledge of $250 or more will get you this year’s postcard, the Sergeant button, and an ORIGINAL PIECE OF MUNCHKIN CARD ART. This is the only way you can get original Munchkin art that I’ve drawn (and I choose nice pieces to send to folks). I don’t sell original Munchkin card art. Not many people have it. But you can be one of life’s winners! 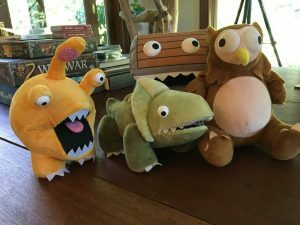 The art will be from a fantastic new Munchkin core game, to be announced at Gen Con 2018. Until then it is SUPER SEKRIT!!! Five folks who pledged at any of the lower levels will be selected at random to receive original Munchkin card art! GEN CON has kicked in two (!) four-day passes for 2019, for a couple of lucky backers. 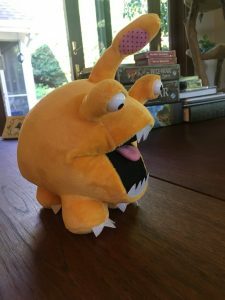 The very first Otyugh Gamehole Con plushie (signed and numbered) will also go out to a randomly chosen backer. LOOK HOW EXCITED SHE IS! And this is just the starting swag! With luck (and generosity), there’ll be MORE cool stuff coming. And if we’re lucky enough to hit $5,000, $7,500 and $10,000, *everybody* who pledges at $25 or above will get something else really cool! $7,500 – I create a new Army of Dorkness rank – “Right Hand Man (or Woman.”) All pledges at $25 of above get this new button, available only during this campaign. $10,000 – DID I MENTION IF WE HIT $10,000 I WILL WEAR THE DUCK OF DOOM ON MY HEAD AGAIN? I believe I mat=y have. And all pledges at $25 or above get a signed Munchkin bookmark or card. ARE YOU IN THE MADISON AREA? Ride along with me! We’ll call ourselves – I dunno – “Team Duck,” or something. Registration is still open, but this ride fills up quickly! The Army of Dorkness (YOU folks) have supported this ride, and this great charity, five years running, now, raising more that $60,000 to help low income families receive nutritious farm food. On average, your support counts for 1/3 of the money aides for this event. THIS IS A LOT OF PRESSURE, yes. But this is a local charity, doing amazing work, and the impact you make every year, supporting my Insane Charity Ride, is incalculable! You continue to blow me away with your generosity. Donate now! Or ride! Or just help spread the word! Now…let’s do this again. And make me wear that darned duck one more time!